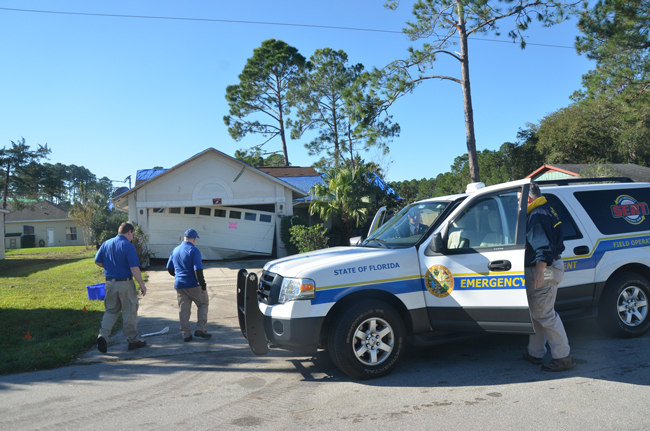 Federal officials are in Palm Coast today to assess the damage of last Saturday’s tornado, but they are not with FEMA, the Federal Emergency Management Administration, as the city previously said. Rather, they are officials with the Small Business Administration (SBA), who are assessing damage to see if homeowners may qualify for SBA loans to conduct repairs. “We are not involved in that assessment and have not been asked to be,” Kurt Pickering, an external affairs spokesman for FEMA, said Thursday. “The confusion is that sometimes SBA and FEMA work together,” Palm Coast spokeswoman Cindi Lane said, explaining the genesis of information Palm Coast has been disseminating, with that information specifying that FEMA would be conducting a damage assessment locally. In fact, Palm Coast has not and will not be qualifying for FEMA assistance under the Stafford Disaster Relief and Emergency Assistance Act. So FEMA cannot be involved. City officials were aware that the SBA would be conducting the assessments, but had assumed that the SBA was working in conjunction with FEMA or representing it. So as not to confuse residents, FEMA’s name was used, Lane said, as residents might wonder why the SBA is involved. Even though not a single business has been affected by Saturday’s tornado, it is the SBA that may provide loans to homeowners in such situations–assuming certain damage thresholds are met–thus offering a financial bridge until insurance reimbursements are received. But while the SBA and FEMA do at times work together, one never represents the other, Pickering said. The SBA must tally at least 25 homes whose value has been reduced by 40 percent to cross the threshold that then enables the agency to make loans available to Palm Coast homeowners. That’s the purpose of today’s visit: to evaluate whether that threshold is met. As usual Flagler Live was on top of the story.. I drove by and Pierre was interviewing one of the officials at the scene .. Great Job in covering this event..